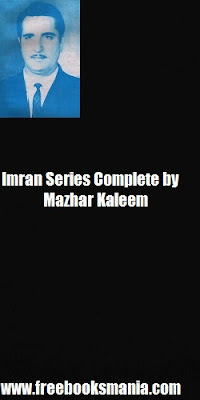 Imran Series Complete by Mazhar Kaleem is now on freebooksmania. Mazhar Kaleem was a great name in the Urdu espionage, after the death of Ibn-E-Safi he was the man who took the responsibility of Imran Series Complete by Mazhar Kaleem and wrote quality episodes.Imran a non-serious detective with his team offers his skills to secret service. imran series pdf books free downloadImran with a great sense of humor, fast mind and clever tricks always destroys his enemies protecting the security status of his country. After Ibn-Safi death many people attempted to try their luck and continue the Imran Series but no one better than Mazhar Kaleem appeared and he satisfied the wide readers of imran series by mazhar kaleem list. Following is the complete list of Novels by Mazhar Kaleem.